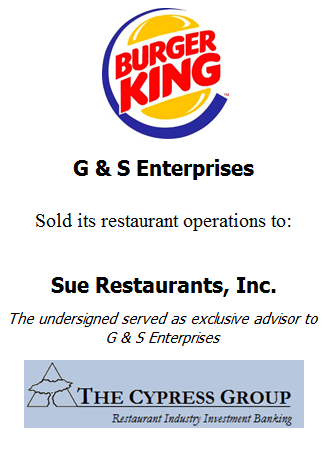 The Cypress Group served as exclusive advisor to Sabo Ventures in the sale of its 10 Burger King restaurant operations and related real estate to GPS Hospitality. 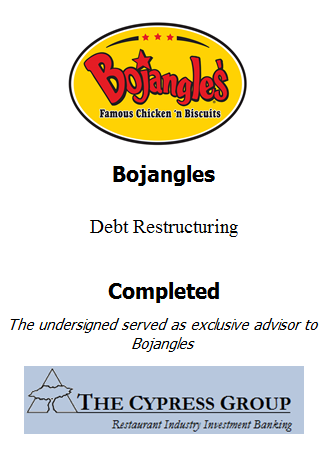 The restaurants are located in Athens and Atlanta, Georgia. Cypress provided valuation services, identified potential acquirers, structured the deal terms, and advised Sabo Ventures throughout the transaction process. “I’ve known the Cypress team for years and have always been impressed by their professionalism and experience in guiding my alternatives as an owner and ultimately a seller. 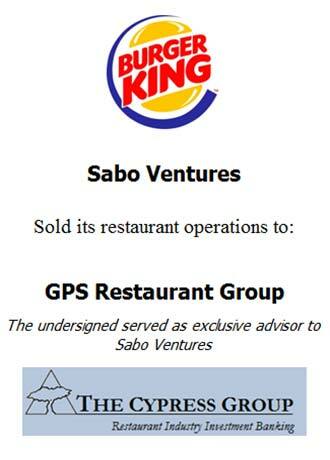 In the recent sale of my restaurants, Cypress identified a creative solution that allowed Sabo Ventures to maximize the proceeds on the sale of my Burger King restaurants and related real estate. By packaging two separate transactions in adjacent markets, Cypress created scale for both the buyer and sellers and enabled all groups to pursue a transaction on favorable terms. 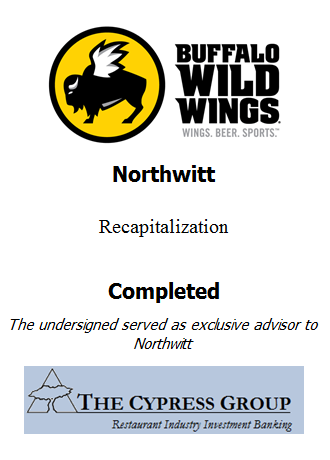 This transaction closed on schedule with minimal complications. I can and will highly recommend Carty, Dean, and Cypress to my Burger King colleagues in the future.” –Frank Sabo, CEO of Sabo Venture. 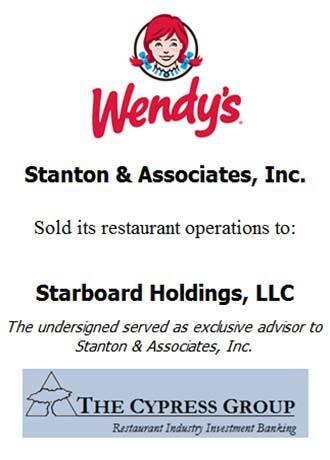 The Cypress Group served as exclusive advisor to Stanton & Associates, Inc. in the sale of its 67 Wendy’s restaurants to Starboard Holdings, LLC. 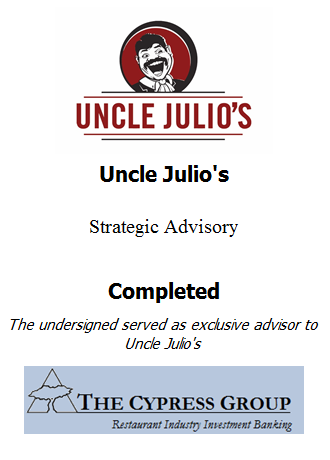 The restaurants are located in Central and Southeastern Michigan. 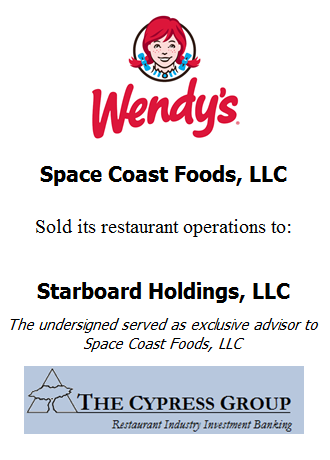 Starboard Holdings is an affiliate of Starboard Group and is controlled by longtime Wendy’s franchisee, Andrew Levy. 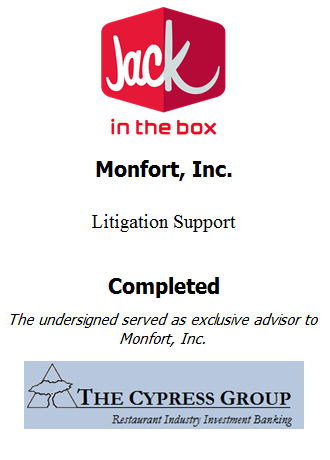 Cypress provided valuation services, identified potential acquirers, structured the deal terms, and advised Stanton & Associates throughout the transaction process. – Mark Behm, President of Stanton & Associates, Inc. 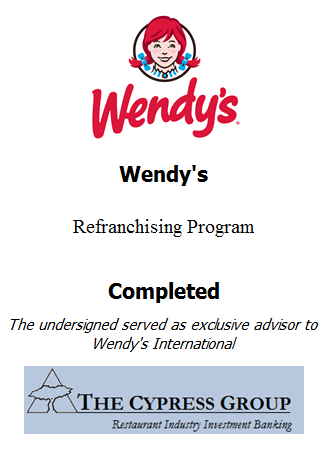 The Cypress Group is serving as exclusive advisor to Wendy’s in the refranchising of approximately 540 Company restaurants across 15 markets in the United States. These markets include Pittsburgh, Philadelphia, West Palm Beach, Springfield/Albany, Shreveport, Boston, Baton Rouge/Lafayette, Cincinnati, Charleston, Atlanta, New York, Raleigh-Durham, New Orleans, Miami/Ft. Lauderdale, and Chicago. 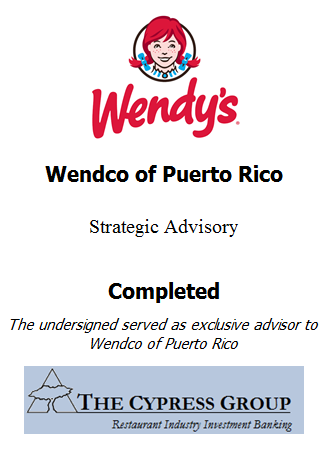 Cypress is providing strategic guidance and valuation services, identifying potential acquirers, and structuring deal terms for Wendy’s. The Cypress Group served as exclusive advisor to TGI Fridays in the refranchising of 139 Company restaurants across 10 markets in the United States. These markets include Central Florida, South Florida, Chicago, Minneapolis, Indianapolis, Detroit, Boston, Upstate New York, Philadelphia, and New Jersey. 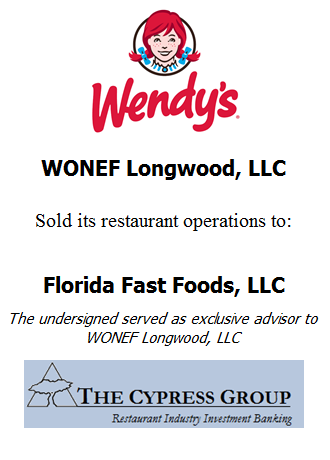 The Cypress Group served as exclusive advisor to Space Coast Foods, LLC and Square Treasure Foods, LLC in the sale of 25 Wendy’s restaurants to Starboard Investment Holdings, LLC. 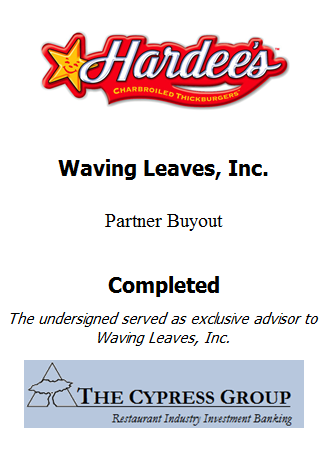 Cypress provided valuation services, identified potential acquirers, negotiated the deal structure, and advised the owners of Space Coast Foods and Square Treasure Foods throughout the transaction process. 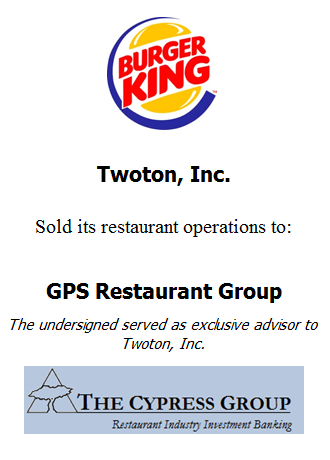 The Cypress Group served as exclusive advisor to Twoton, Inc. in the sale of 36 Burger King restaurants to GPS Hospitality, LLC. The restaurants are located in Pennsylvania, New Jersey, and Maryland. Cypress provided valuation services, identified potential acquirers, structured deal terms, and advised the owners of Twoton throughout the transaction process. 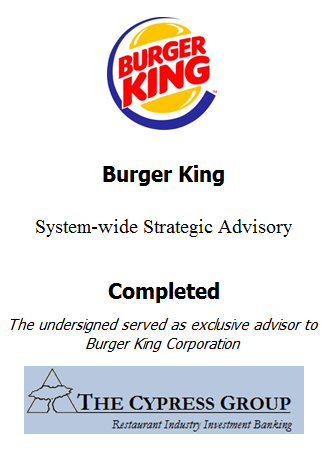 Twoton was one of the original Burger King franchisees, operating since 1967. 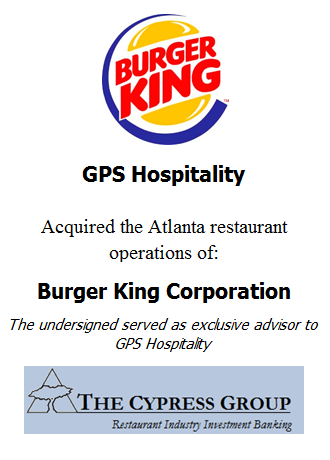 GPS Hospitality is one of the largest Burger King franchisees with approximately 150 restaurants across Indiana, Kentucky, Ohio, Georgia, and West Virginia. 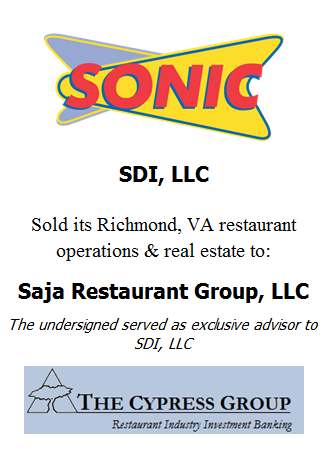 The Cypress Group served as exclusive advisor to SDI, LLC in the sale of 11 Sonic restaurants and related real estate properties to Saja Restaurant Group, LLC. The restaurants are located in Richmond, Virginia. Cypress provided valuation services, identified potential acquirers, structured deal terms, and advised the owners of SDI throughout the transaction process. 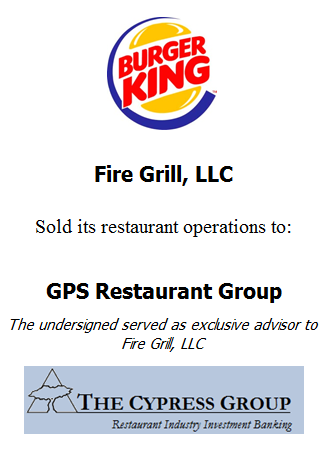 The Cypress Group acted as exclusive advisor to Fire Grill, LLC and affiliates in the sale of 42 Burger King restaurants to GPS Hospitality. 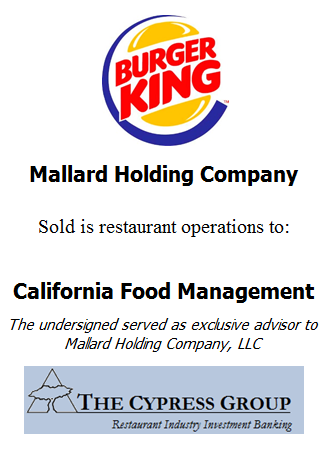 The restaurants are located in Cincinnati, Ohio and were owned by Fire Grill through a private equity firm located in Southern California. 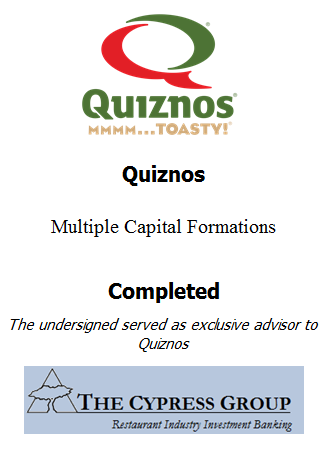 Cypress provided valuation services, identified potential acquirers, structured the transaction, and advised Fire Grill through the closing. 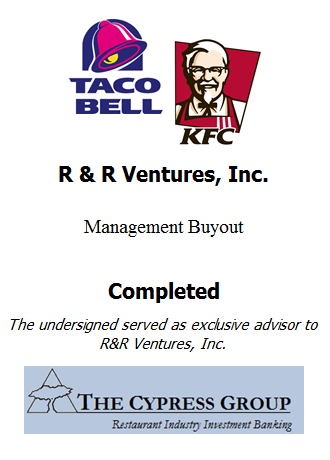 The Cypress Group acted as the exclusive advisor to R & R Ventures in the acquisition of 28 Taco Bell restaurants in Atlanta, Georgia. Cypress provided valuation services, identified potential lenders, negotiated deal terms, and advised the owners of R & R Ventures throughout the process. 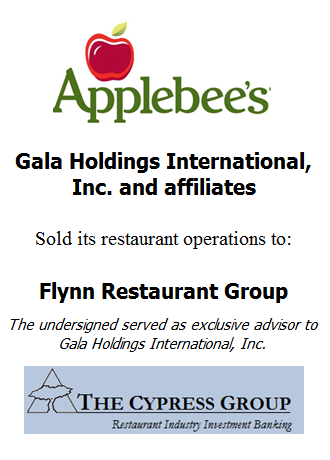 The Cypress Group acted as exclusive advisor to Gala Holdings International, Inc. and affiliates in the sale of 18 Applebee’s restaurants to a subsidiary of Flynn Restaurant Group. The restaurants are located in San Francisco’s East Bay as well as in central California. Cypress provided valuation services, identified potential acquirers, structured the transaction, and advised Gala through the closing. 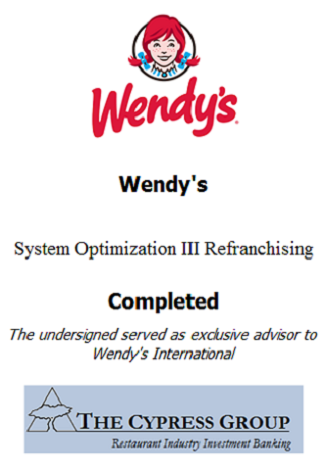 The Cypress Group served as exclusive advisor to Wendy’s in the refranchising of over 400 Company owned restaurants across 9 markets. These markets included Albuquerque, Austin, Dallas, Hawaii, Los Angeles, Phoenix, Portland, Sacramento, and Salt Lake City. 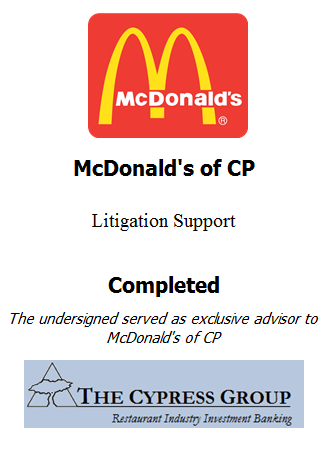 Cypress provided strategic guidance and valuation services, identified potential acquirers, and structured deal terms for Wendy’s. 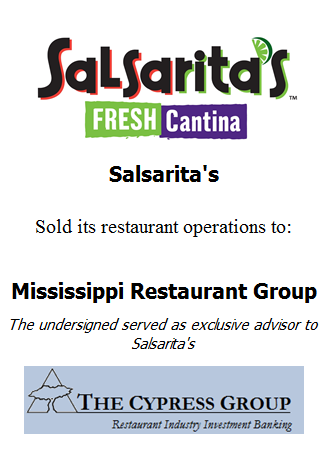 The Cypress Group served as exclusive advisor to Salsarita’s in the sale of the Company to the Mississippi Restaurant Group, LLC. The Company retained Cypress to evaluate a variety of strategic options, including the sale of the concept, a partial liquidity event for the ownership group, and raising growth capital for the brand, ultimately electing to sell the company to Mississippi Restaurant Group. Mississippi Restaurant Group is led by Phil Friedman, the former CEO of McAlister’s Deli. Salsarita’s is a growing independent fast-casual brand serving fresh Mexican cuisine. The company is headquartered in Charlotte, North Carolina and has over 80 locations throughout the Central and East United States. The Cypress Group acted as the exclusive financial advisor to Carolina Restaurant Group, Inc. and its affiliates in the sale of their Wendy's Restaurants located in Daytona Beach and Orlando, Florida to Race Coast Foods, LLC. 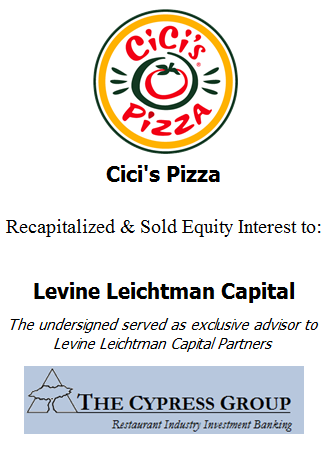 The Company retained Cypress to examine strategic alternatives for the company including reviewing liquidity alternatives on the franchise and related real estate assets. 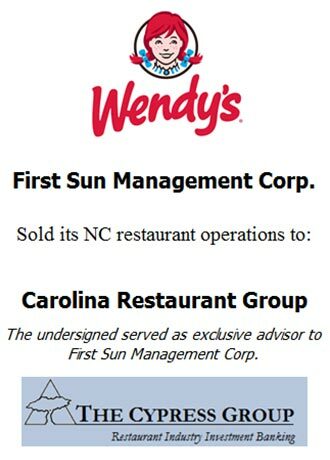 Carolina Restaurant Group is one of the largest and most successful franchisees of the Wendy's System operating over 80 units in North Carolina, South Carolina, and Florida. 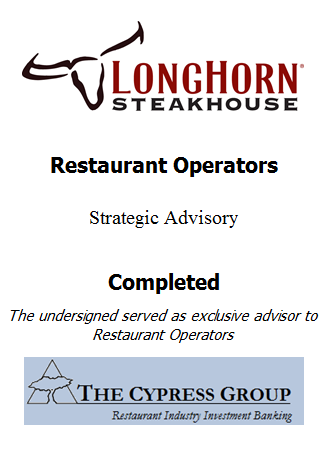 The Cypress Group acted as the exclusive financial advisor to Blue Ribbon Restaurants, LLC in the management buyout and financing of Blue Ribbon, led by Elliott Baum, CEO of the Company. The Company retained Cypress to structure the management buyout and to secure the financing to facilitate the acquisition. 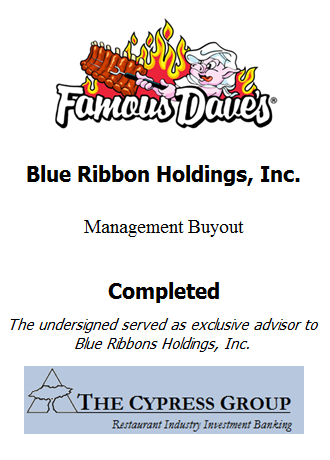 Blue Ribbon Restaurants is one of the largest and most successful franchisees of the Famous Dave’s Franchise System, a casual brand serving award-winning BBQ throughout the United States. Blue Ribbon is headquartered in Michigan and operates locations throughout Michigan and Ohio. 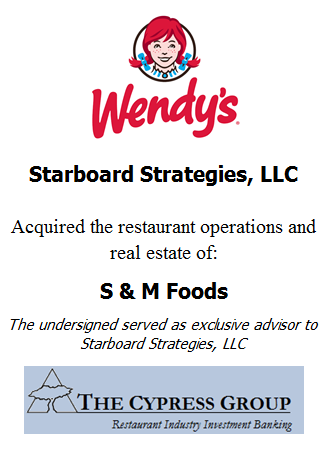 The Cypress Group acted as the exclusive buy-side advisor to Starboard Strategies, LLC in the acquisition of Wendy's restaurants and related real estate from S & M Foods. 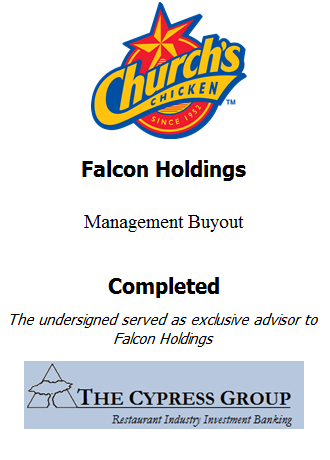 Cypress represented Starboard as the buyer in identifying the opportunity, structuring the transaction, and arranging the financing to complete the transaction. 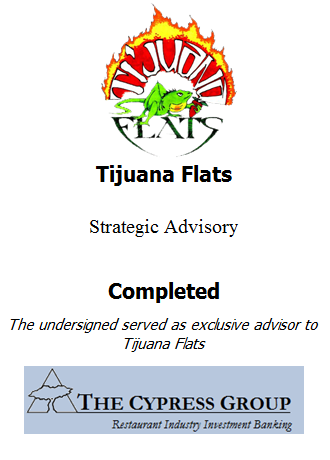 The Cypress Group acted as the exclusive financial advisor to Tijuana Flats. 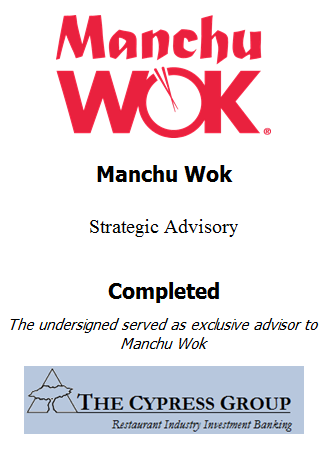 The Company retained Cypress to evaluate a variety of strategic capitalization options for the brand. Tijuana Flats is a culturally driven Mexican fast-casual concept with approximately 100 locations operating in the Southeastern United States. 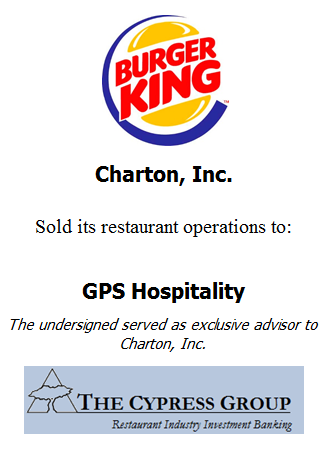 The Cypress Group acted as the exclusive advisor to Charton, Inc. and affiliates in the sale of its Burger King restaurants to GPS Hospitality. The restaurants are located in West Virginia and Ohio. Cypress provided valuation services, identified potential acquirers, negotiated the deal structure, and advised the owners of Charton, Inc. throughout the transaction process. 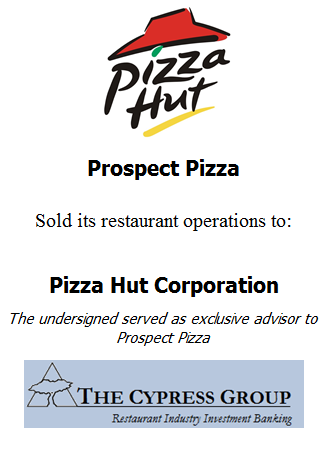 The Cypress Group provided valuation services to Noodles & Company. Noodles & Company is a national brand with nearly 500 locations specializing in noodle-based cuisine from around the world. The Cypress Group served as the exclusive financial advisor to Carolina Restaurant Group in the recapitalization of their Wendy’s franchise operation and related real estate obligations. 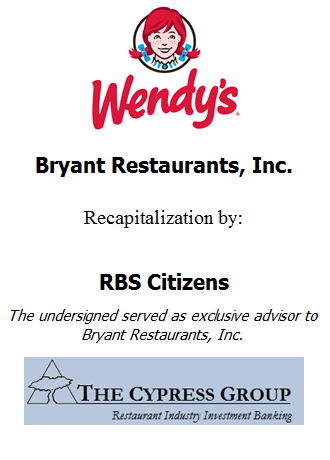 The loan was facilitated through RBS Citizen’s restaurant lending group. The recapitalization completed an engagement in which Cypress advised the Company on a number of strategic alternatives, including the sale of a non-strategic market and select real estate assets to position the company for refinancing. 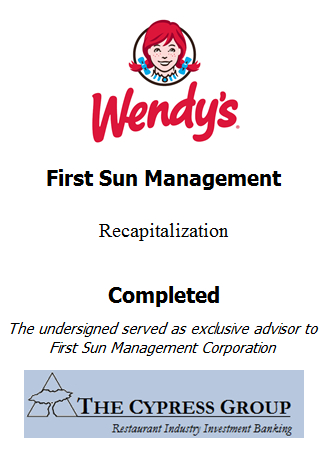 The new facility, which provided CRG with more favorable terms, pricing, and flexibility positions the company to expand its Wendy’s portfolio in its core markets in North and South Carolina. Carolina Restaurant Group is one of the largest and most successful franchisees of the Wendy’s System, operating over 80 units in the Carolinas. 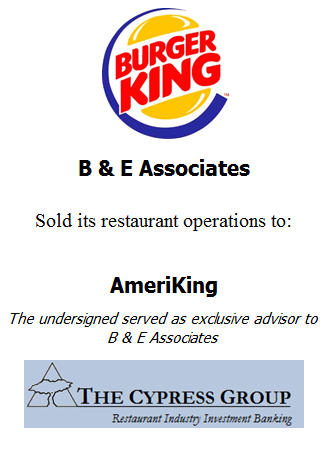 The Cypress Group acted as the exclusive advisor to GPS Hospitality in the acquisition of 42 Burger King Restaurants in the Atlanta market from Burger King Corporation. 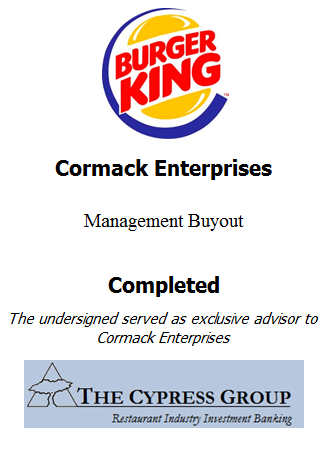 Cypress represented Garrett in identifying the opportunity, structuring the transaction with BKC and arranging the financing to complete the transaction. The purchase represents GPS’ initial acquisition in the Burger King ® system. 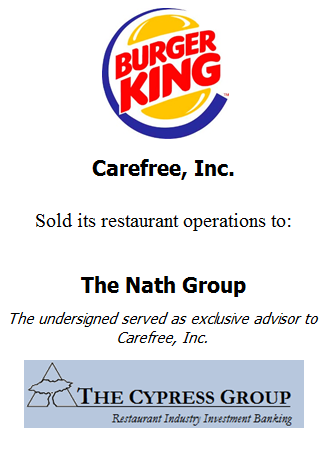 Financing for the GPS acquisition was provided by Infinity Franchise Capital. 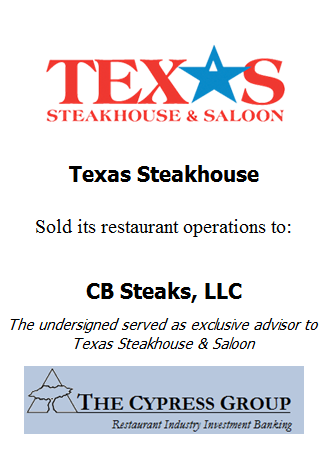 The Cypress Group acted as the exclusive financial advisor to Texas Steak, Ltd. and Boddie-Noell Enterprises, Inc. in the sale of their Texas Steakhouse and Saloon concept and its related real estate assets to CB Steaks, LLC, a subsidiary of the parent company Charlie Brown's Steakhouse. 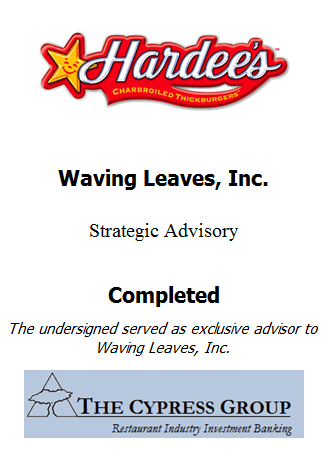 Cypress and the company evaluated several alternatives as part of the engagement before facilitating the sale to the parent of Charlie Brown's. 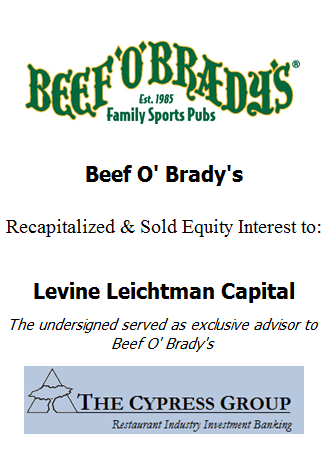 The transaction was supported by STORE Capital which provided sale / leaseback financing for the transaction. 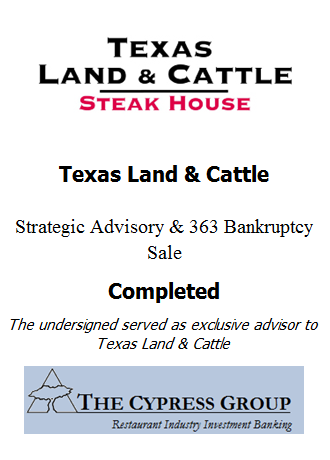 The Texas Steakhouse concept was launched in the 1980's in Virginia and has grown to include 19 restaurants in VA, NC and WV prior to the sale. Boddie-Noell is ranked as the 6th largest domestic franchise operator with approximately $400MM in annual revenue. The sale will allow Boddie-Noell to focus on its core QSR restaurant operations as the largest franchisee of Hardee's restaurants in the United States. 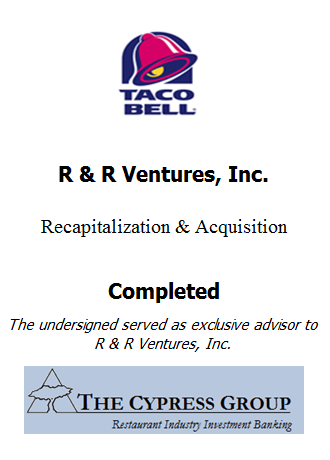 The Cypress Group acted as the exclusive advisor to R & R Ventures in the refinancing of its Taco Bell Restaurants and the acquisition of corporate Taco Bell Restaurants in the Mid-Atlantic region of the United States. Cypress represented R & R in identifying the opportunity for the financing, conducting a competitive process, structuring the transaction and managing the closing. 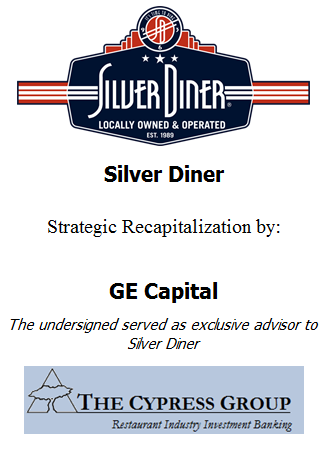 The refinancing will be used to retire existing debt, fund the acquisition and provide additional liquidity for new unit development and image upgrades. 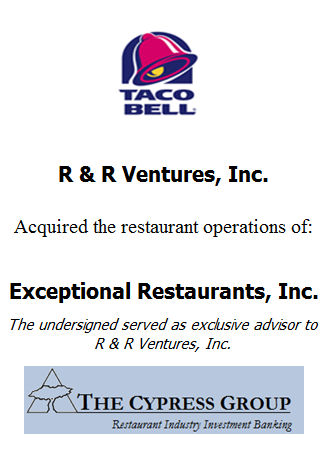 R & R is owned by Robert Carlucci, a 25+ year veteran of the Taco Bell system. 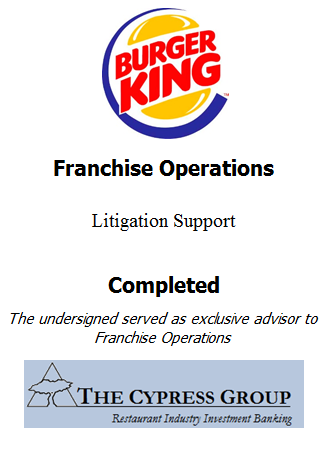 Cypress served as exclusive advisor to Burger King Corporation and its franchisees through our tailored Franchisee Advisory Program, providing financial support for the overall Burger King franchise system. 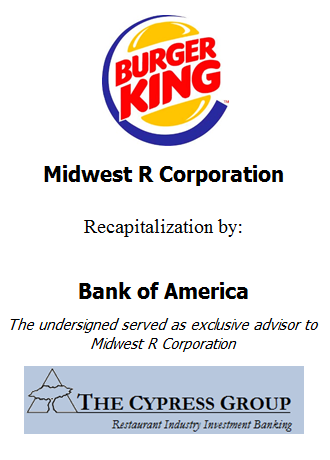 Sponsored by the franchisor, our assistance for the system as a whole encompassed all of our comprehensive services including balance sheet restructuring, stakeholder negotiations, capital raising, and sale of assets. 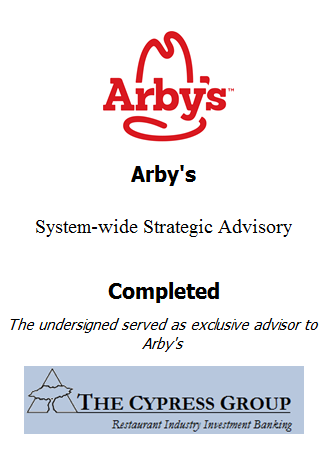 Cypress served as exclusive advisor to Arby’s Restaurant Group and its franchisees through our tailored Franchisee Advisory Program, providing financial support for the overall Arby's franchise system. 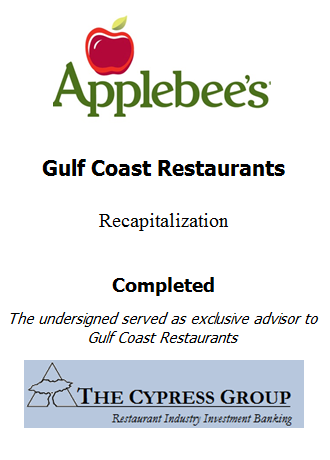 The Cypress Group acted as the exclusive advisor to Concord Hospitality, Inc. and affiliates in the sale of its Applebee's restaurants to ACON Franchise Holdings, LLC. 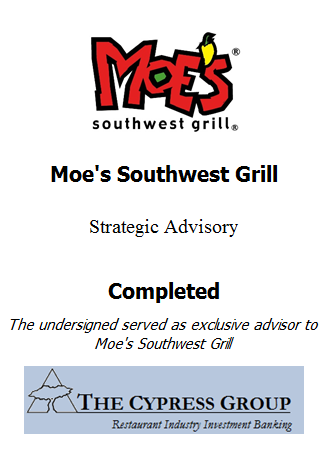 The restaurants are located in 9 states, including NE, KS, MO, and WY in the Midwestern to western region, TX and OK, and the Gulf Coast region of FL, AL, and MS. In addition to the enterprise transaction, Cypress also structured a transaction to sell Concord's its fee-owned properties in a Sale/Leaseback transaction to STORE Capital. Cypress represented Concord in the valuation of its enterprise and real estate assets, identifying potential acquirers, structuring the transactions, and providing guidance through the closing. 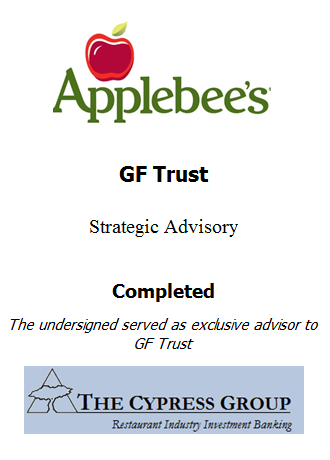 The purchase represents ACON's initial acquisition in the Applebee's system. 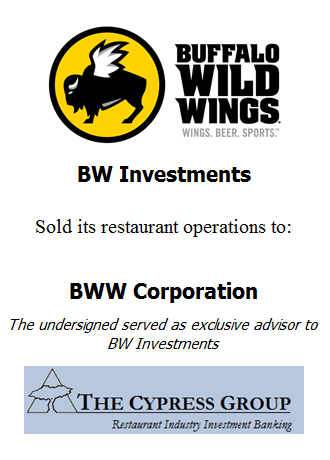 The Cypress Group served as exclusive advisor to BW Investments in the sale of its Buffalo Wild Wings restaurants to BWW Corporation. 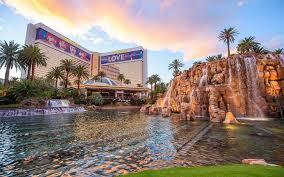 The restaurants are located in Las Vegas, Nevada. Cypress provided valuation services, identified potential acquirers, negotiated the deal structure, and advised the owners of BW Investments throughout the transaction process. 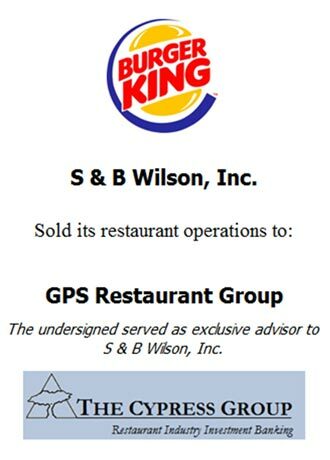 The Cypress Group served as exclusive advisor to S & B Wilson, Inc. in the sale of its 11 Burger King restaurant operations and related real estate to GPS Hospitality. The restaurants are located in the Northeast Atlanta suburbs along with the Gainesville, Georgia market. Cypress provided valuation services, identified potential acquirers, structured the deal terms, and advised S & B Wilson, Inc. throughout the transaction process. – Sally Wilson, Owner of S & B Wilson, Inc. 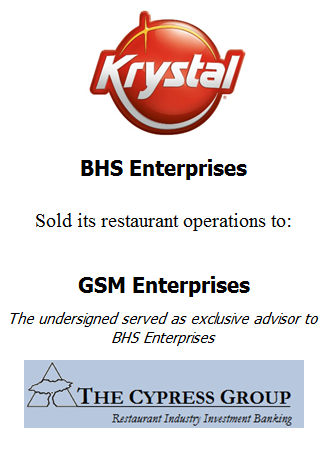 The Cypress Group served as exclusive advisor in the sale of SDI's restaurant operations and related real estate property to Rubyhill Ventures. SDI operated a total of 11 locations in the Denver, CO market. 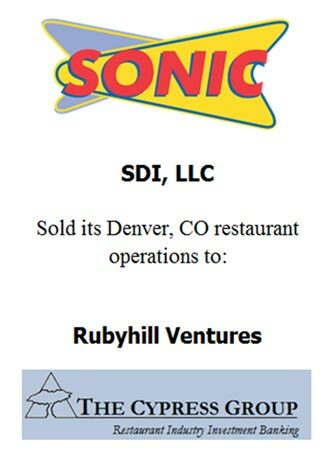 This transaction represents Rubyhill Ventures first investment in the Sonic system. 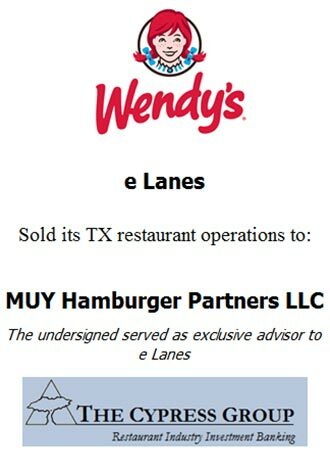 The Cypress Group served as exclusive advisor to e Lanes in the sale of its Texas restaurant operations. 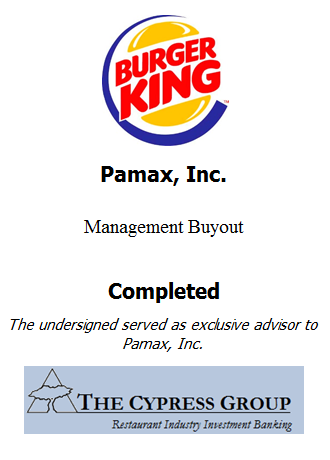 The 10 Dallas based restaurants were acquired by MUY Hamburger Partners. 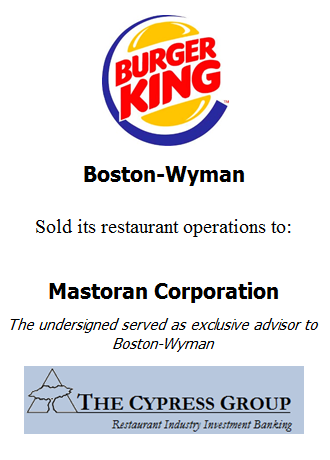 MUY Hamburger Partners is a large, multi-brand franchisee, operating 314 Pizza Hut restaurants, 172 Wendy’s, and 76 Taco Bells. 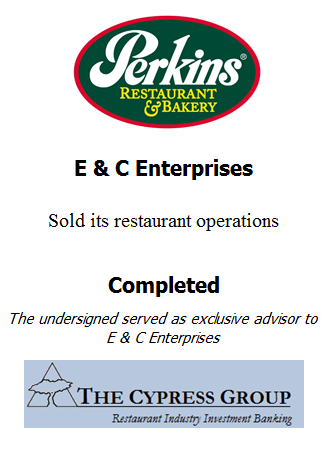 The Cypress Group served as exclusive advisor to Mega Operations in the sale of its restaurant operations to Carrols Restaurant Group. The 9 restaurants are located in New Jersey. 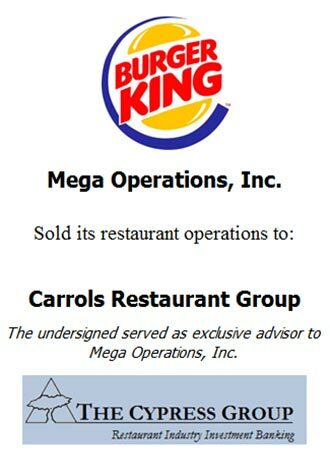 Carrols Restaurant Group owns and operates more than 700 Burger King restaurants across 16 states. 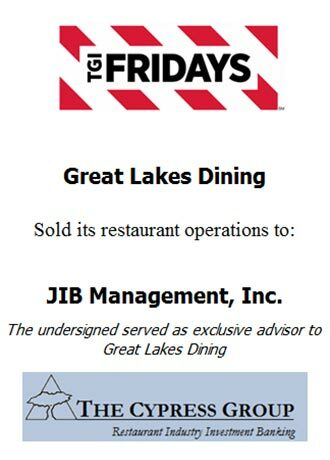 The Cypress Group served as exclusive advisor to Great Lakes Dining in the sale of its restaurant operations to JIB Management. 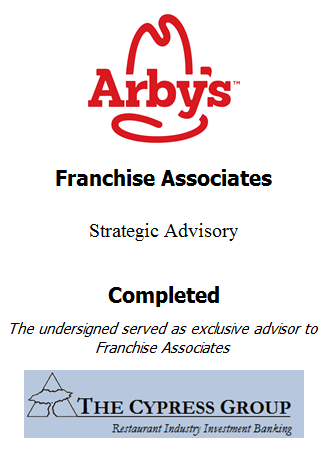 JIB is a large, multi-brand franchisee, operating 219 Jack in the Box restaurants, 72 TGI Fridays, 37 Denny’s, 6 El Pollo Locos, 5 Corner Bakeries, and 4 Sizzlers. 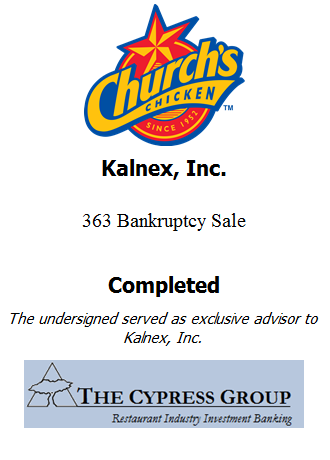 The Cypress Group served as exclusive advisor to First Sun Management in the sale of its 13 Alabama restaurant operations to Wendy’s of Bowling Green. Wendy’s of Bowling Green is an active Wendy’s franchisee, operating 53 restaurants in Alabama, Indiana, Kentucky, and Tennessee. The Cypress Group served as exclusive advisor to First Sun Management in the sale of its 15 North Carolina restaurant operations to Carolina Restaurant Group. 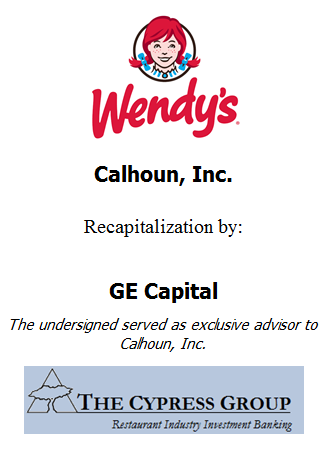 Carolina Restaurant Group is an active Wendy’s franchisee, operating 82 restaurants in North and South Carolina. The Cypress Group served as exclusive advisor to First Sun Management in the recapitalization of its remaining business, consisting of 18 Wendy’s restaurants located in Georgia and South Carolina. 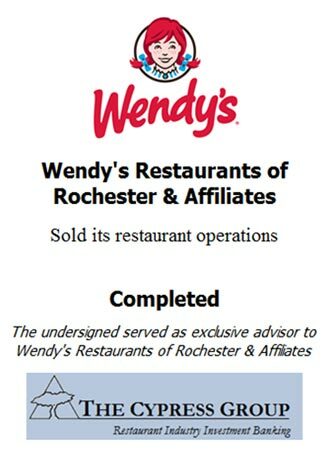 The Cypress Group served as exclusive advisor to Wendy’s Restaurants of Rochester, Wendy’s of Ft. Wayne, Western Reserve Restaurant Management, Wendy’s of Lorain, CC Restaurant Management, and Great Lakes Restaurant Management in the sale of 113 Wendy’s restaurants. The restaurants were sold as 5 markets: Rochester, Buffalo, Albany, Ohio, and Indiana. 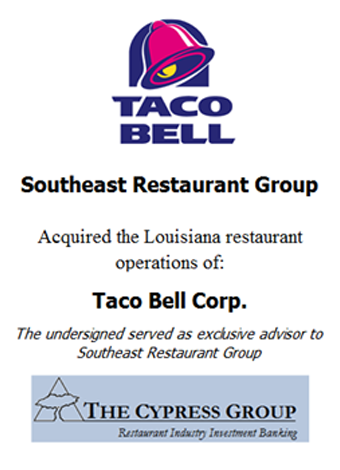 The Cypress Group served as exclusive advisor to Southeast Restaurant Group in the acquisition of the corporately-owned Taco Bell restaurants, related real estate, and development rights in the New Orleans metropolitan area. 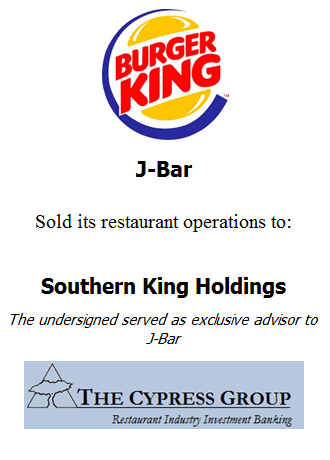 SRG, in combination with its sister company, KFK Group, currently operate restaurants, hotels, and other real estate ventures in seven states with hallmark brands such as Westin, Holiday Inn, TGI Friday’s, and now Taco Bell. 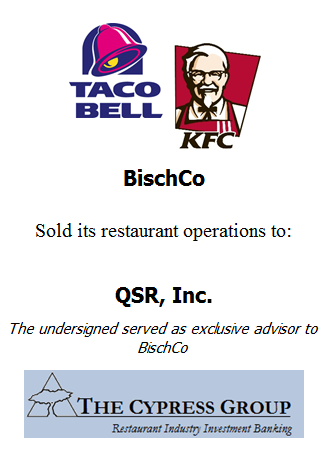 The purchase of the Taco Bell assets marks SRG's initial expansion into the QSR segment. The Cypress Group served as exclusive advisor to Porter Apple in the sale lease back of its Applebee’s restaurants. 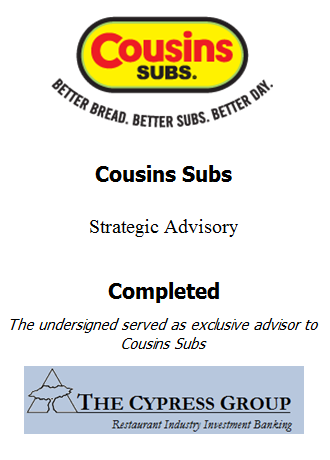 The restaurants are located in South Dakota, Nebraska, and Iowa. STORE Capital, based in Arizona, is one of the largest and fastest-growing net-lease REITs in the United States. 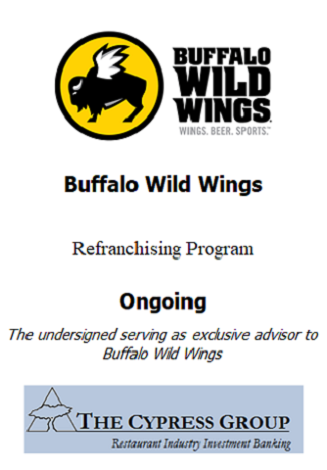 The Cypress Group is serving as exclusive advisor to Buffalo Wild Wings in the refranchising of approximately 80 Company-owned restaurants across 5 markets. The 4 U.S. markets include: Pennsylvania/New Jersey, Greater Washington D.C., Northeast U.S. (NY, MA, RI, CT), and South Texas. 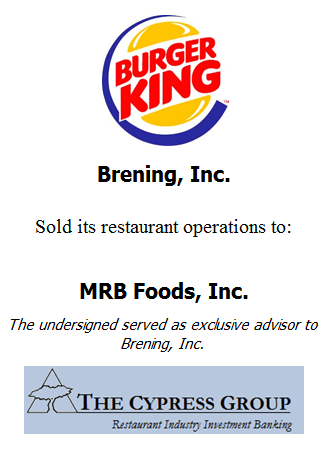 Additionally, BWW is looking to refranchise all of its Company-owned restaurants in Canada. 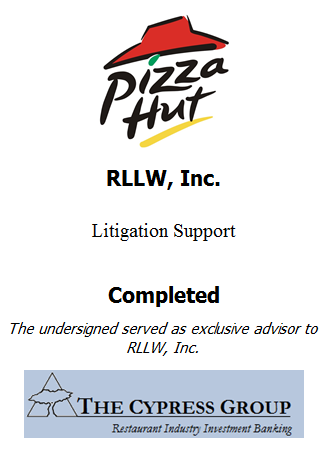 Cypress is providing strategic guidance and valuation services, identifying potential acquirers, and structuring deal terms for Buffalo Wild Wings. 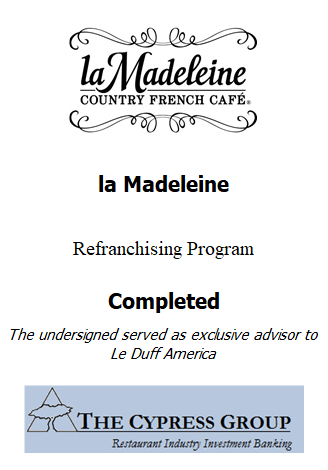 The Cypress Group served as exclusive advisor to Le Duff America in the refranchising of 29 Company-owned la Madeleine Country French Café restaurants in 4 core markets; Atlanta, Austin, Houston, and Louisiana. 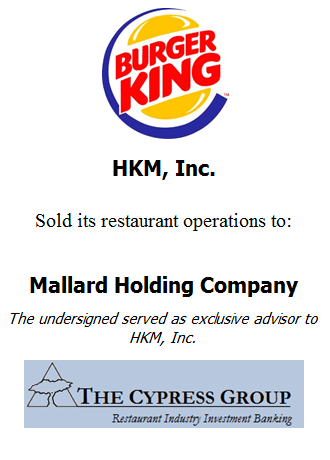 The first group of stores, consisting of the 26 restaurants in the Austin, Houston, and Louisiana markets, has been awarded and sold to HZ LM Casual Foods, marking the organization’s entrance into the la Madeleine system. 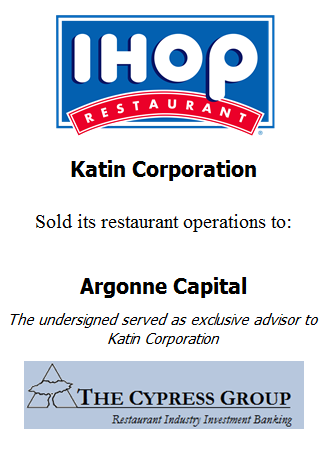 The remaining 3 restaurants in Atlanta were awarded and sold to R. Hakim Corp, an existing la Madeleine franchisee. Cypress provided strategic guidance and valuation services, identifying potential acquirers, and structuring deal terms for Le Duff America. 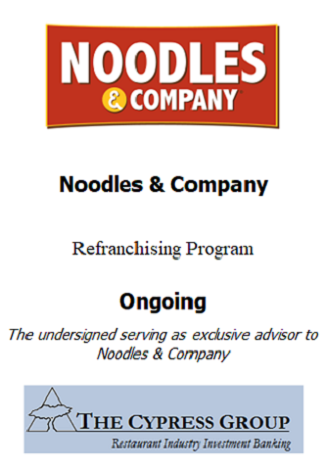 The Cypress Group is serving as exclusive advisor to Noodles & Company in the refranchising of certain Company-owned restaurants across the United States. To date, the released markets include North Carolina and Tennessee/Virginia. 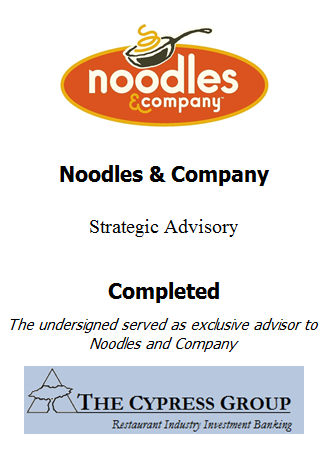 Cypress is providing strategic guidance and valuation services, identifying potential acquirers, and structuring deal terms for Noodles. 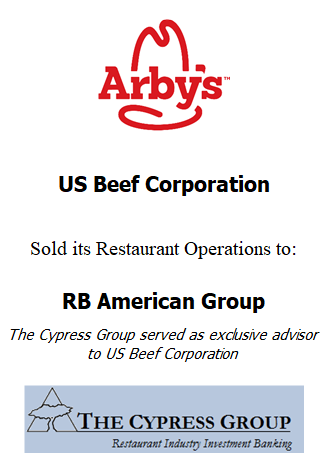 The Cypress Group served as exclusive advisor to Cascade Beef, Inc. in the sale of its Arby's restaurants and to US Beef Corporation. 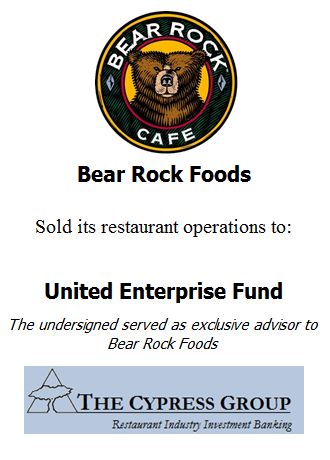 The restaurants are located in Idaho and Washington. 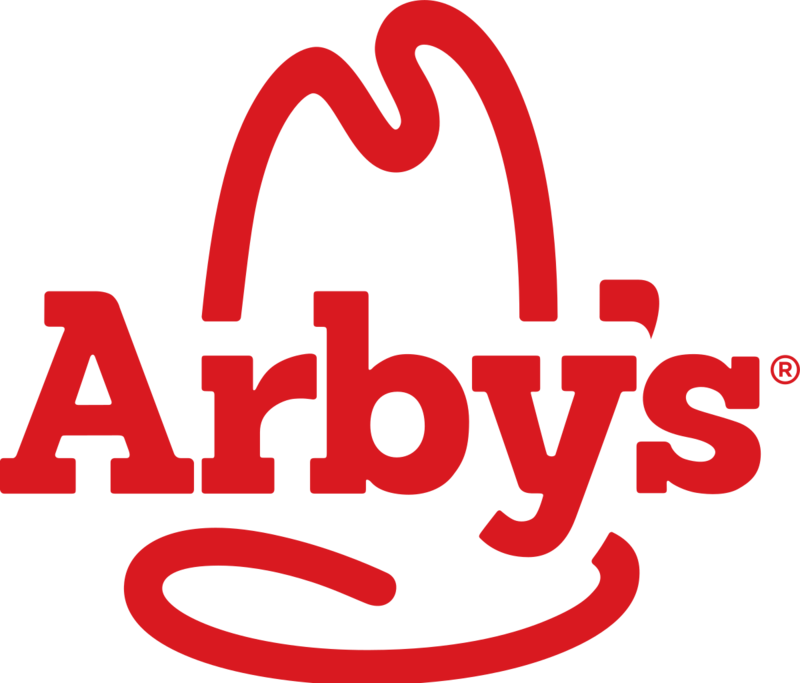 US Beef Corp, the largest Arby's franchisee and one of the largest franchisee organizations in the world, currently operates more than 330 Arby's restaurants over 8 contiguous Midwest and Western states. 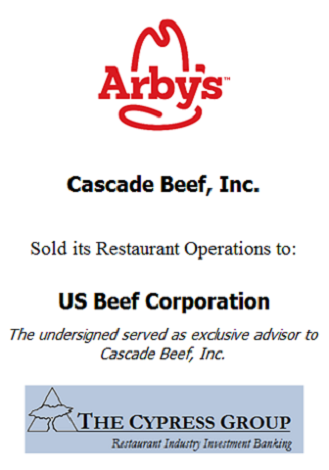 Cypress provided valuation services, identified potential acquirers, structured the deal terms, and advised Cascade Beef throughout the transaction process. 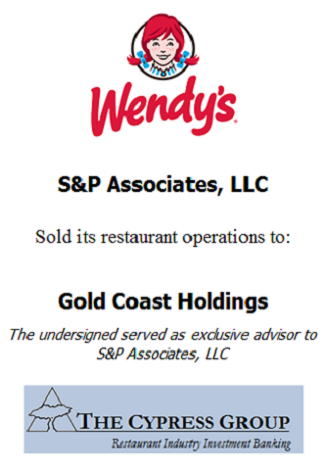 The Cypress Group served as exclusive advisor to S&P Associates, LLC in the sale of its 15 Wendy's restaurants located in the Jacksonville and Orlando, Florida DMAs. Cypress provided valuation services, identified potential acquirers, structured the deal terms, and advised S&P Associates throughout the transaction process. 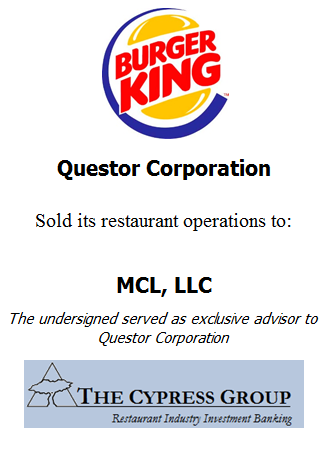 The Cypress Group served as exclusive advisor in the sale of QSR Burger's restaurant operations and related real estate to Ampler Burgers. 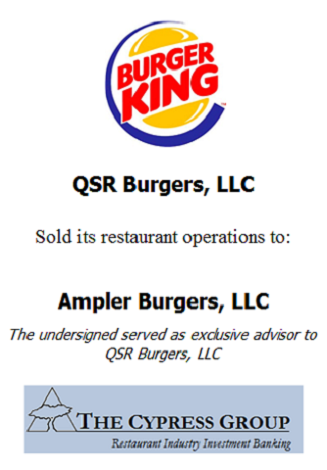 Ampler Burgers is a new entrant to the Burger King system. For more information regarding our services and expertise in the multi-unit restaurant industry, please reach us according to the information below. 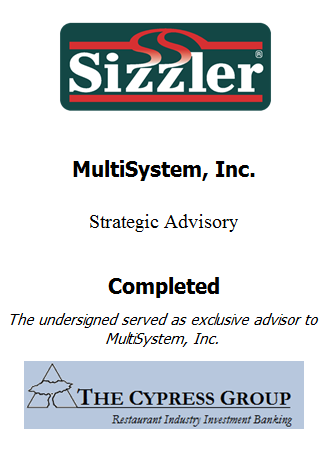 The Cypress Group served as exclusive advisor to ZAK, LLC in order to design a strategy to restructure the Company through multiple transactions. Cypress advised in the acquisition of Weaver Enterprises, Inc.'s KFC and Taco Bell restaurants and related real estate in Iowa, Illinois, and Wisconsin. 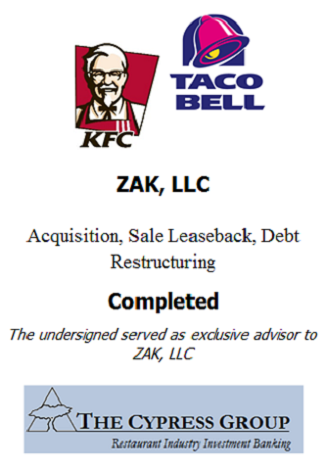 Additionally, Cypress arranged the Senior Debt financing for the transaction through Huntington Bank and Sale Lease Back financing for 15 of ZAK's existing fee properties to Stonebriar Commercial Finance. 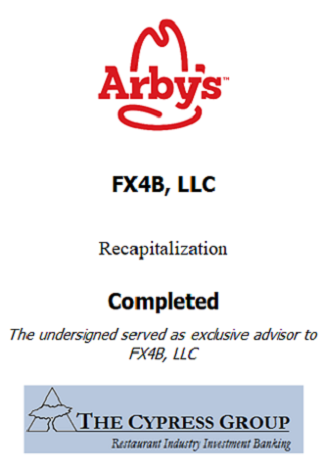 The Cypress Group served as exclusive advisor to FX4B, LLC in the recapitalization of its Arby’s business, consisting of 47 restaurants located in Arizona. 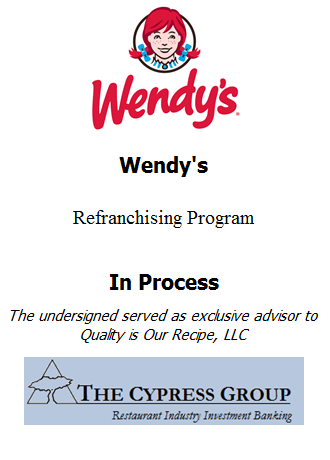 The Cypress Group is served as exclusive advisor to Wendy’s in the refranchising of approximately 540 Company restaurants across 15 markets in the United States. These markets included Pittsburgh, Philadelphia, West Palm Beach, Springfield/Albany, Shreveport, Boston, Baton Rouge/Lafayette, Cincinnati, Charleston, Atlanta, New York, Raleigh-Durham, New Orleans, Miami/Ft. Lauderdale, and Chicago. 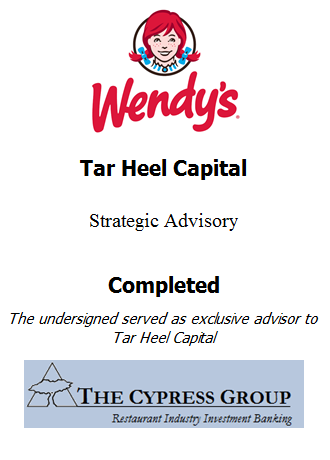 Cypress provided strategic guidance and valuation services, identifying potential acquirers, and structuring deal terms for Wendy’s. 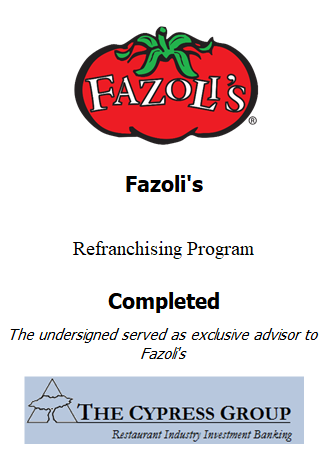 The Cypress Group served as exclusive advisor to Fazoli's Restaurants, LLC in the refranchising of a number of Company-owned Fazoli's Restaurants located in 11 states. UP Properties II, an existing Fazoli's franchisee and affiliate of the Junior Bridgeman Group, acquired all of the refranchised restaurants. 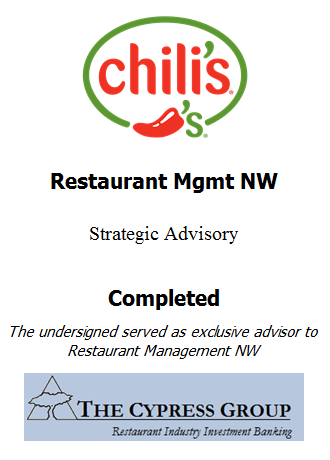 Cypress provided strategic guidance, valuation services, identification of potential buyers, and deal term structuring and negotiation for Fazoli's. 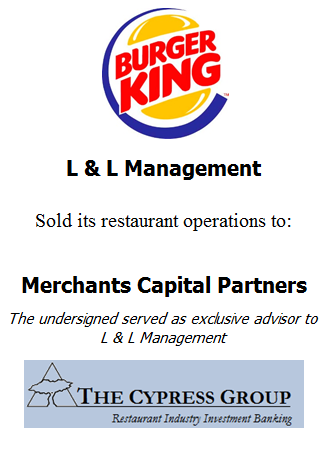 The Cypress Group served as exclusive advisor to Liberty Restaurant Group in the sale of its Burger King restaurants located in Missouri and Illinois. 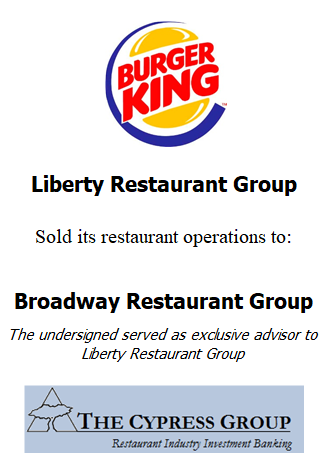 The buyer, Broadway Restaurant Group, is an existing Burger King franchisee, and already operates restaurants in the Midwest U.S.
Cypress provided strategic guidance, valuation services, identification of potential buyers, and deal term structuring and negotiation for Liberty. 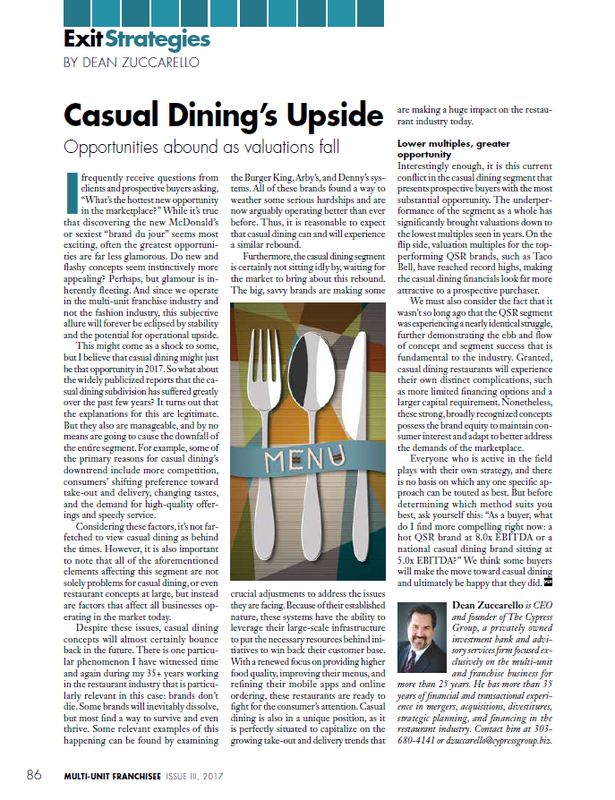 UP Properties II, an existing Fazoli's franchisee, acquired all of the refranchised restaurants.